SUMTER COUNTY, Ga. — A viral photo of a man posing next to a giant alligator has been making the rounds on social media and many are wondering if it is fake. 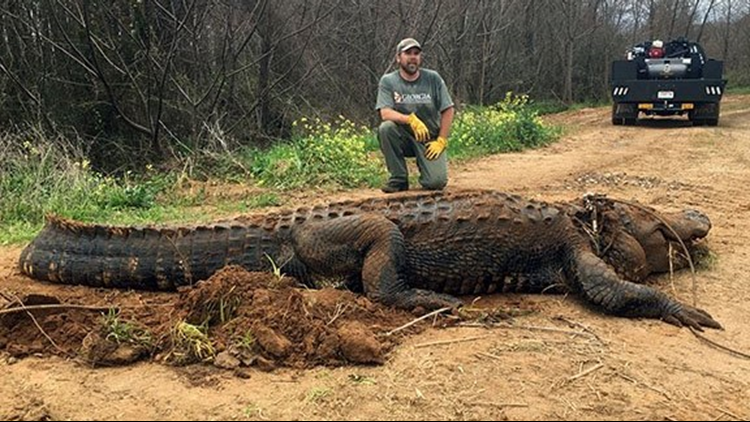 The photo showed a DNR wildlife biologist posing next to the giant animal lying along a cleared pathway in Sumter County near Lake Blackshear. An alligator that was approximately 13 feet 4 inches long and 700 pounds was discovered in an irrigation ditch near Lake Blackshear. Is this alligator real and was it really living along Lake Blackshear? Yes. A wildlife biologist with the Georgia Department of Natural Resources found the animal. The alligator was found in an irrigation ditch off of Lake Blackshear, according to Melissa Cummings with the Georgia DNR. It was 13 feet 4 inches long and weighed approximately 700 pounds. According to the biologist, the animal had been in the irrigation ditch for close to a week, which Cummings said was very unusual behavior. Once it moved to land, biologists noticed several old gunshot wounds on the animal. However, because of its poor health, the alligator had to be put down, Cummings said. This alligator got pretty close to being the largest ever found in Georgia. The largest alligator ever recorded during Georgia’s alligator hunting season was 14 feet long. It was found in Lake Walter F. George and harvested in 2015. The heaviest alligator that was hunted in 2011 was 860 pounds and 13 feet 4 inches long, Cummings said. According to the Georgia Wildlife alligator fact sheet, male alligators can grow up to 16 feet in length, although 14 foot long gators are rare. Female alligators can grow up to 10 feet. Do you have a claim you'd like our VERIFY team to look into? Email us at verify@11alive.com. Is the '48-hour challenge' real? Is marijuana really the gold mine people claim? Do blue light-blocking glasses protect your eyes?